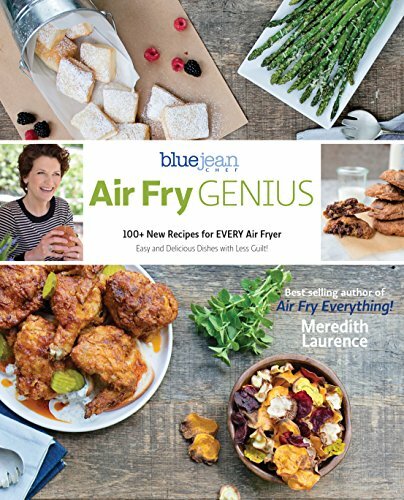 Are you are looking for the highest quality air fryer on the market? Then the Philips HD9240/94 is the model you have been searching for! Its patented design with a non-stick basket and stainless steel pan are just some of the features that will make dinner prep a snap. With capacity enough to prepare a meal for two and one of the best warranties on the market, this fryer will be working for you for years to come! Should You Buy the Philips XL Airfryer? Let’s take a closer look at the top features and then unbox this unit together. Philips air fryers come with a patented starfish-shaped design that circulates the air from top to bottom and through your stacked foods. 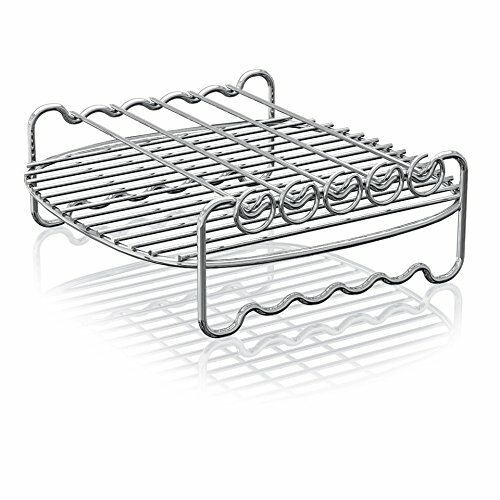 This ensures even browning and reduces the need to flip or shake your foods during the cooking cycle. The rapid air technology helps your food cook faster and uses less energy than a full sized oven. It is easy to select your time and temperature on this unit! You simply select the temperature from 180-390F and hit start! Once the air fryer is preheated, you add your food to the pan in the basket and set the timer. Non-stick Basket and Pan are Dishwasher Safe! Clean up couldn’t be easier with the Philips! 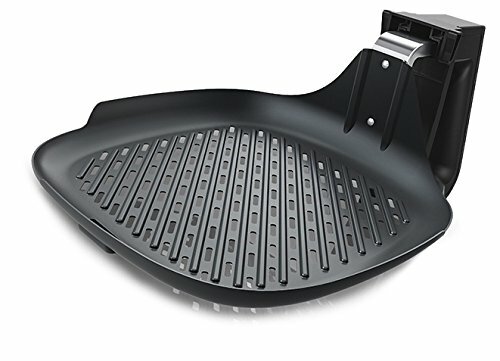 The removable basket and interior stainless steel cooking pan are coated with a non-stick coating, so your food will slide right off. Both basket and pan are dishwasher safe as well, leaving little to clean by hand! The exterior is smooth and easy-to-wipe clean. The unit is compact and sturdy for its size and is typical of the Philips brand. The black color will look right at home in any modern kitchen, and the exterior is designed to stay cool to the touch while in use. Perfect Size for the Average Two-person Family! It is a medium capacity unit, with a 3.5 quart removable pan. This allows you to make two full bags of frozen fries at a time! If you buy an additional accessory you can even cook your food in two layers, allowing multiple items to be cooked at the same time. 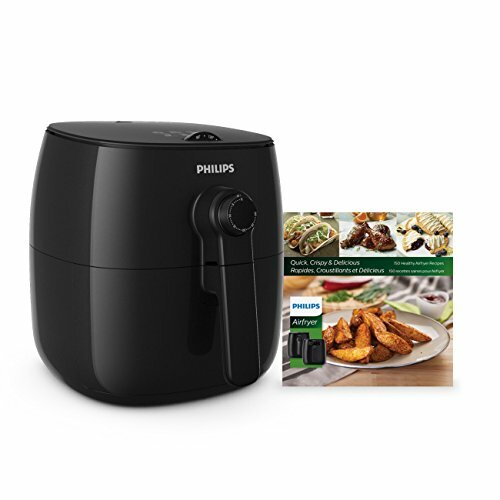 Philips guarantees its air fryer for one year against defects. As always with these kinds of warranties, it is not protected against rough handling or breakage. Always use appropriate utensils to prevent damage to the non-stick coating on the basket and detachable pan. Philips has a great reputation and has been making air fryers for years. You can rely on the Philips brand for quality. The design is simple to use and easy to clean, including the dishwasher safe basket and pan. The unit comes with many recipes right out of the box. There are several Philips-brand accessories that you can buy separately to customize your unit. There is only one customizable pre-set option! You can choose the temperature and time of your favorite food and store it for easy reuse…but only a single combination can be stored. There are no built-in preset buttons, although it does have a printed guide on the front of the unit. Although it uses Philips patented “starfish” rapid air circulation, you still have to shake food like fries and chips at least once during the cooking process to get even browning. The unit is much more expensive than comparable models. Unless you find it on sale or deeply discounted, expect to pay $100-200 more than on a comparable unit to get the Philips name. The unit is compact but still large for its 3.5 quart capacity, and weighs almost 19 pounds! You probably don’t want to move it frequently. With the Philips brand being known for quality, it is no surprise that the reviews for the air fryer are overall very positive! Reviewers love that the unit is so dependable and easy to clean. The dishwasher safe basket and interior pan get mentioned a lot as a favorite feature. The non-stick coating will eventually wear off, so don’t be surprised if after a couple of years you have to replace them. The flexibility of the unit and its ability to quickly prepare healthy, oil-free meals for up to two people is a definite plus for many. 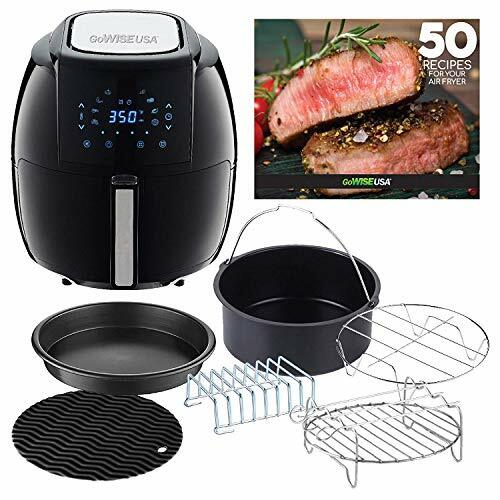 One customer noted that she preferred her Philips unit over her other air fryer for most uses and said it was perfect for two people cooking a healthy meal like halibut with asparagus and sweet potato fries. A basic fryer with manual controls, this compact unit has TurboStar technology that will quickly heat and circulate the air, resulting in frustration-free air frying! The small 2.75 quart capacity is perfect for the smaller family, and the non-stick basket and pan are both dishwasher safe! Clean up is hassle free, and Phillips has a great name for making quality fryers! This 5.8 quart capacity unit is packed full of features and perfect for making meals for up to 4 people! With 8 built-in preset buttons, choosing the right time and temperature is a breeze. The unit comes in a variety of colors to match any kitchen decor, and the exterior and handle will stay cool during use. It also has a pause function and an adjustable reminder timer! Yes, we can recommend it, with a couple of reservations. If you are looking for a starter unit or just want to see if you like using an air fryer, then this is not the ideal choice for you. 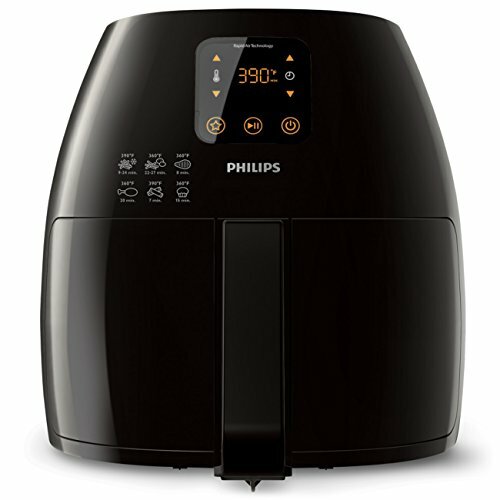 This unit is best for smaller families and for people who already know they love using an air fryer, and for folks who would prefer having a high quality brand like Philips back their purchase.